What’s the business value of democracy? This is very moving – the faint twitter of Democracy in Iran. The question: is this going to be another Tiananmen Square? Or is there hope for a middle-eastern Wenceslas Square? Ahmadinejad, you have lost the election and your soul. Madness = an 88-year-old white supremacist. Who is to blame? The NRA? The schools? Parents? Republican extremism? FOX News? The Neo-Nazis? Operation Rescue? Hate closes down the world.. And hate speech begets hate-filled actions. The extremists seem to have taken over Israel’s soul. And on top of this we have morons like Rupert Murdoch. On the other side, we have the moving story of Josh Lipsky and his trip to Buchenwald. I see how easy it is to use hate to unite people – the Christian fundamentalists, white supremacists, Jewish settlers, Zionists, Hamas, Taliban, Al-Qaeda – flip sides of the currency of terror. The world is not against you, Israel. You are against you. Hat-tips to Dera and Steven for sending me these stories. Maybe stealing is at the core of the GOP brand DNA? Bing is better than Google. There, I said it. Type in “Godot” and see what I mean. Wolfram Alpha, on the other hand, is a disaster. The less said, the better. I can’t give up on Google, so for now, my new search engine is GooBing! Never, never, never, never. Never will we forget this anonymous hero. 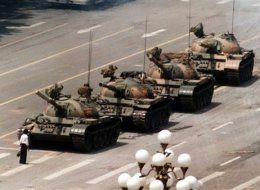 When China does get democracy one day, they will build a statue for him at the very spot in Tiananmen Square. The acquisition of Wind River by Intel should not come as a surprise for anyone who has been paying attention to the rapid evolution of the online experience. We know for example that the future of electronics is collaboration, sharing, and access – anytime, anywhere, on any device..
Companies that build a vision around the future and then work to make that future a reality using their business ecosystems will win the next round of competition after we emerge from the recession. Intel’s shaping strategy, as my friend John Hagel would call it, is nothing short of brilliant. The ultimate irony – both platforms are built on Intel. And in this case, Intel knows something that Microsoft doesn’t – that open systems are the future. The Wind River platform is not limited to automobiles. They’re doing the same across a variety of marketspaces, like the Open Handset Alliance Android – another open source platform. The Wind River acquisition also helps include “Intel Inside” on all the devices which cloud computing will bring. Intel is making sure that the Telcos, IT hosting providers, hardware and software vendors – everyone gets to use Intel as the foundation of their future business. Shaping Strategy 101: Intel gets it. Business stupidity is always a sign of something else more worrisome. Several Burger King franchises in Tennessee have been displaying “Global Warming is Baloney” signs outside their restaurants. The franchises are all owned by a company called the Mirabile Investment Corporation (MIC) that owns more than 40 Burger Kings across Tennessee, Arkansas and Mississippi. Nice going, guys. What next? A “whites-only” sign? Burger King should yank their licenses. I’m sure they can get some other, more responsible, business owners to take over.